On Sunday, 19th April, the Reverend Sarah Marry was licensed by the Bishop of Cork, the Right Reverend Dr Paul Colton, to serve as Priest-in-Charge of Saint Anne’s Parish, Shandon and also as Chaplain of Saint Luke’s Home, Cork. 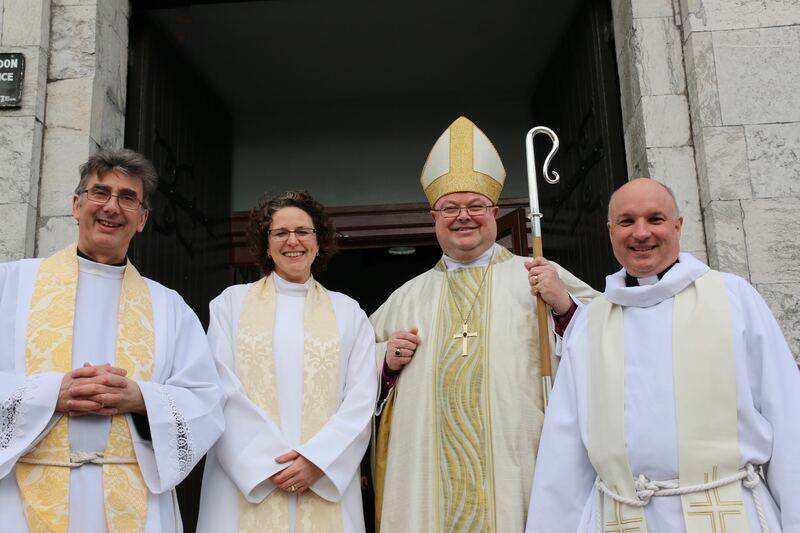 Following the Licensing and Commissioning of the Reverend Sarah Marry as Priest-in-Charge of Saint Anne’s Parish, Shandon, Cork and as Chaplain to St Luke’s Home, Cork were (l-r) the Dean of Cork, the Very Reverend Nigel Dunne, the Reverend Sarah Marry, the Bishop, and the Venerable Adrian Wilkinson, Archdeacon of Cork. This entry was posted in Charities in the Diocese, Church Services, Clergy, Diocese, Healthcare Ministry, LIcensing, Saint Luke's Home, Saint Luke's Home Education Centre. Bookmark the permalink.